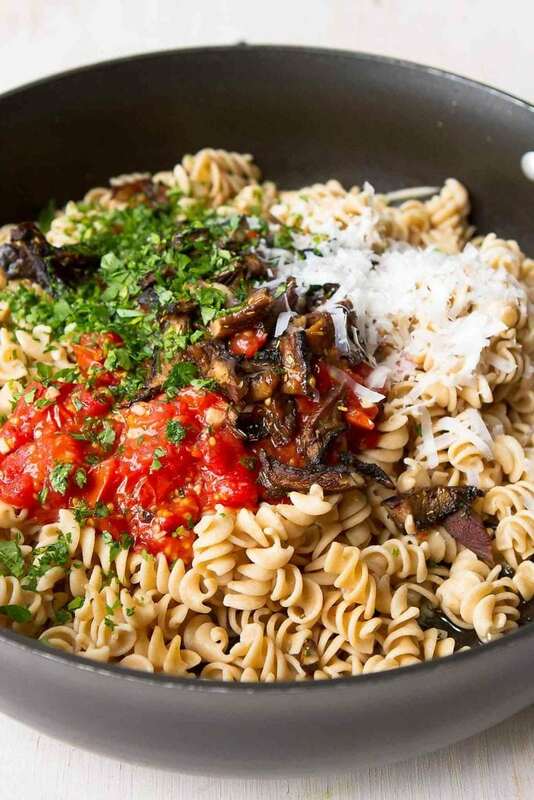 If you are here regularly, you know that I’m the only mushroom lover in this family, which means that making this roasted tomato & mushroom pasta recipe was purely a selfish act. And I’m not feeling even a tiny bit apologetic! This woman loves her mushrooms, my friends. Whether it’s a bowl of roasted mushrooms with rosemary or ragu stuffed portobello mushrooms, I will happily sit in solitary bliss, eating and soaking up all of that mushroom-y goodness. 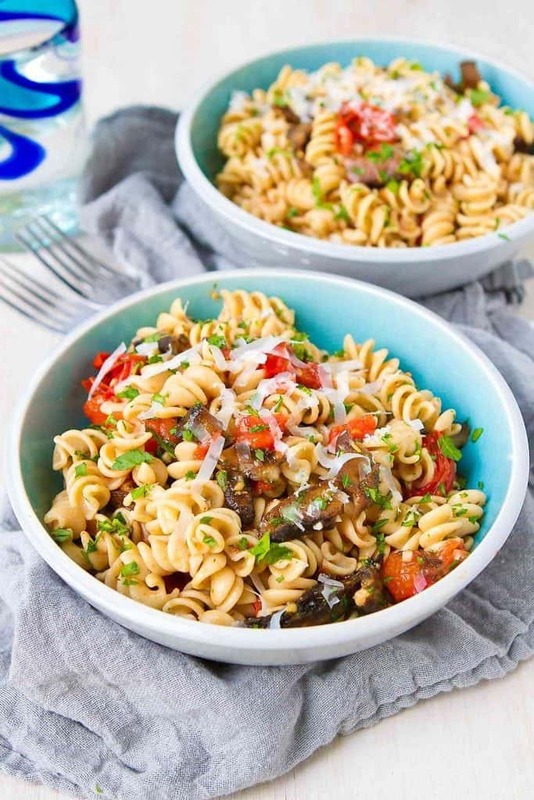 With summertime gardens bursting with tomatoes and mushrooms always on the brain, this healthy pasta recipe seemed like a no-brainer. Roasting the veggies with some herbs and garlic is an easy way to bring deepen the flavors of the vegetables. Once tossed with a garlicky white wine sauce and some Parmesan cheese, they become irresistibly good and there’s a good chance that you won’t even notice that there’s no meat in the recipe. That being said, you could also add some grilled chicken or shrimp if you prefer. Roasting vegetables is one of the easiest ways to add flavor to any dish. 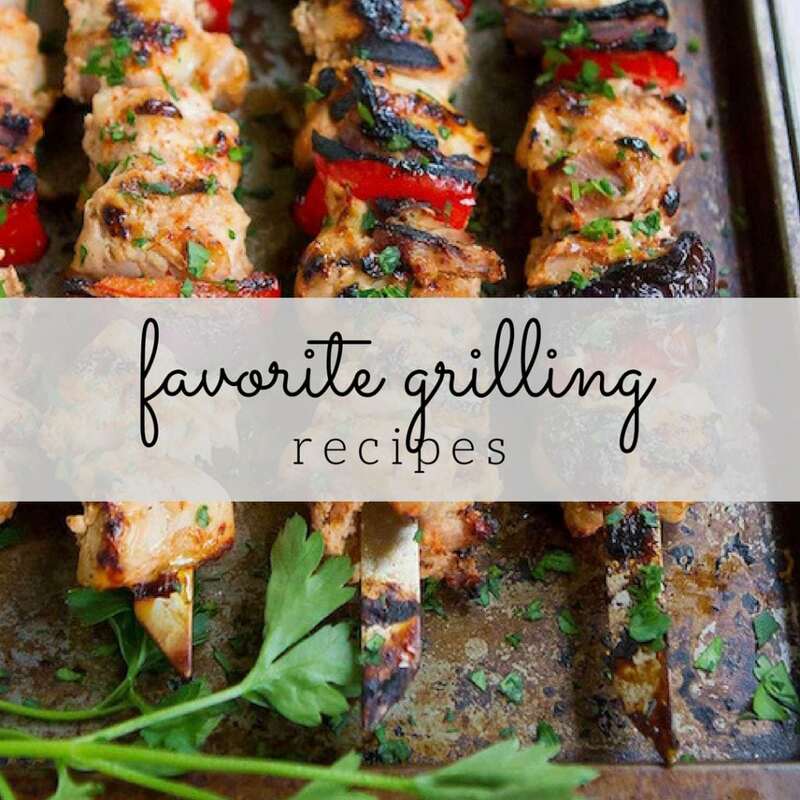 The natural sweetness and depth of the flavors are intensified by cooking them this way. 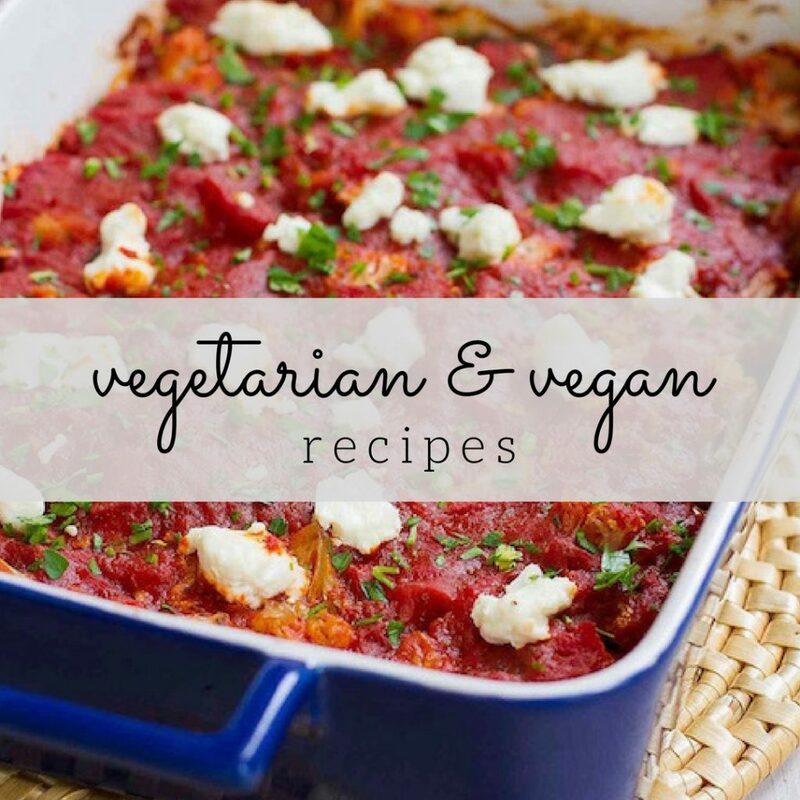 In this recipe, the tomatoes and mushrooms are roasted in the oven at the same time, but on separate baking sheets, rotating the baking sheets in the oven halfway through cooking. If one is done before the other, that baking sheet can easily be removed from the oven. In separate bowls, toss the tomatoes and mushroom slices with olive, herbs, salt and pepper, then spread on the baking sheets. Halfway through roasting, add the garlic to each set of vegetables. By adding them partway through cooking, you can avoid burnt, bitter garlic. While the vegetables are roasting, cook the pasta to al dente and start on the sauce. The sauce takes just a few minutes. The garlic is sauteed in olive oil, then mixed with a pinch of red pepper flakes and dry white wine. Toss everything together in the skillet or saucepan with the white wine sauce, season to taste and serve with extra Parmesan cheese. 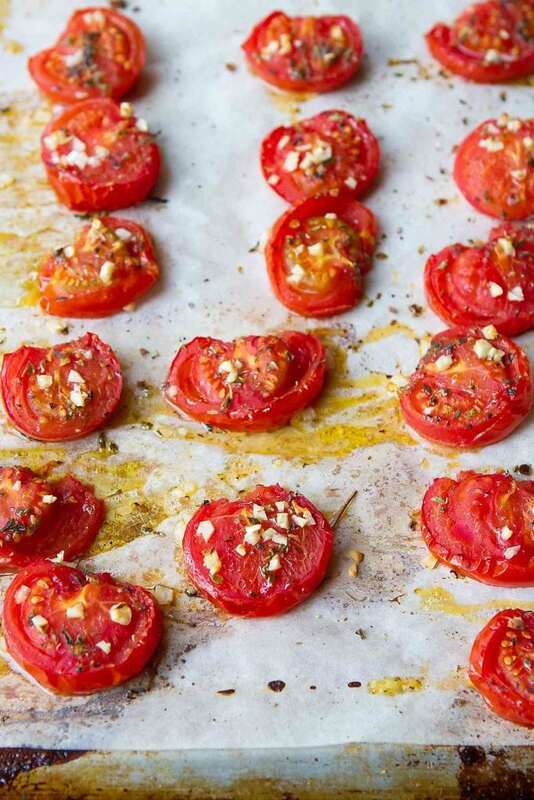 Place the tomatoes in a single layer on the prepared baking sheet. Drizzle the tomatoes with the olive oil, and sprinkle with oregano, salt and pepper. Roast the tomatoes for 10 minutes, sprinkle the garlic over top, then roast an additional 5 to 10 minutes, or until the tomatoes are slightly shriveled and soft. Roughly chop the tomatoes and set aside. Rotate the mushroom and tomato baking sheets after adding the garlic . With a spoon, gently scrape out the gills from the mushrooms. Discard the gills. Slice the mushrooms. Roast until the mushrooms are tender and starting to brown, 5 to 7 minutes more. Roughly chop the mushrooms. In a large saucepan of boiling water, cook the rotini according to package directions. Drain. 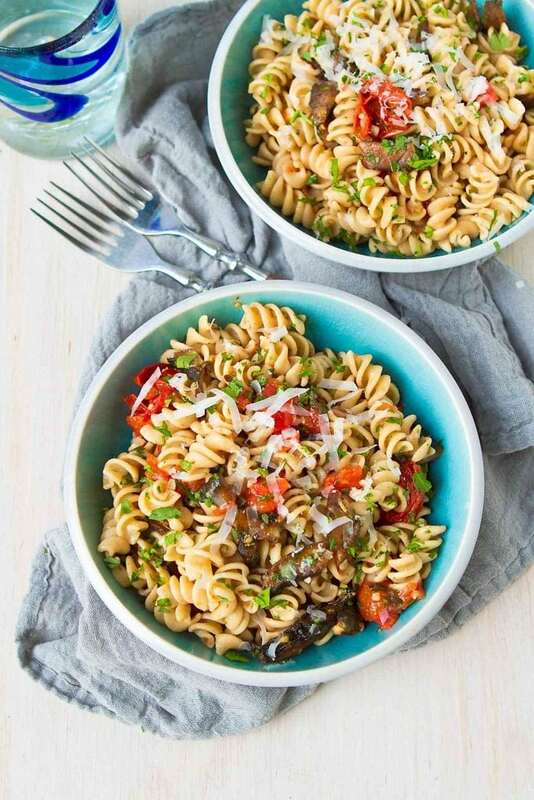 While the pasta is cooking, heat the olive oil in a large skillet or saucepan. Add the garlic and saute for 1 minute. Pour in the wine and add the red pepper flakes. Simmer for 2 to 3 minutes. Add the pasta, roasted tomatoes and mushrooms, parsley and Parmesan cheese to the wine sauce. Toss to combine. Season to taste. Serve with extra Parmesan cheese, if desired. 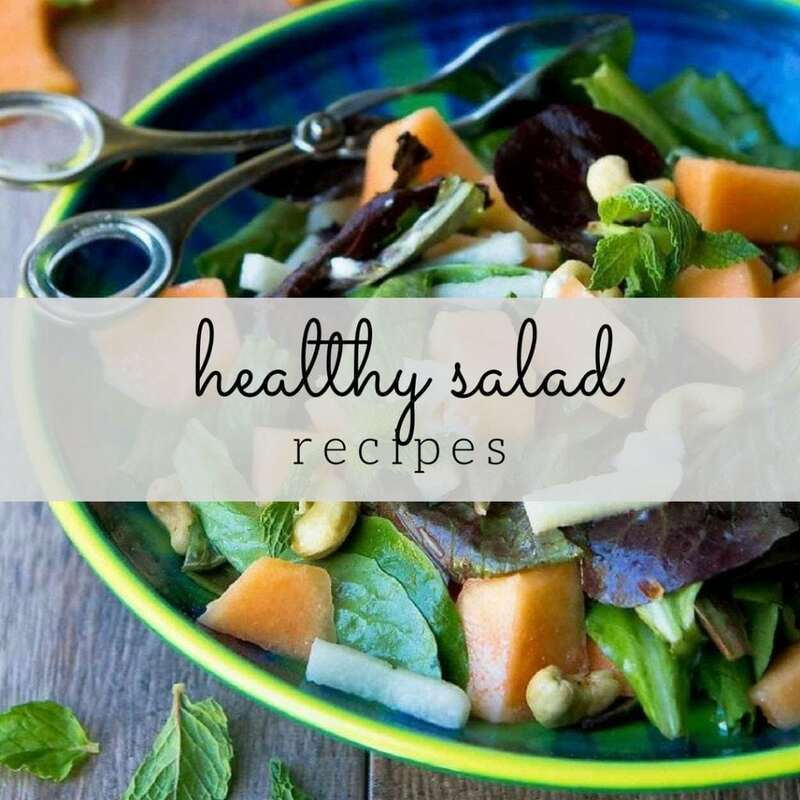 Thank you for the sharing this recipe. 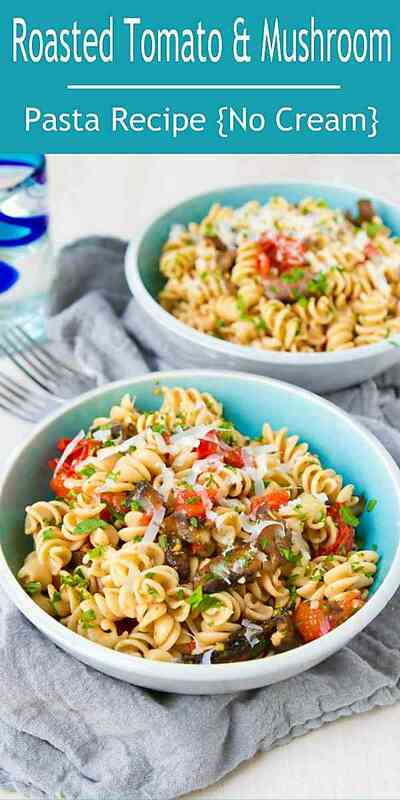 This pasta looks so yummy.